"In my years of coaching, including in the States, I've found that track is not a rich person's sport. Rich kids might have the talent, but they don't have that 'extra oomph.' A lot of people here are living in poverty and they want to get out." - Jamaican coach Wainworth Small, who offers his services to promising runners at no charge. "You'd cry if you knew what went on in their lives," he says. A great insight into the rise of Jamaican track and field from Britain's Telegraph journalist Tom Leonard. So will Verzbicas surpass Fernandez's times in high school? "Who Has the Speed Gene, and Who Doesn't?" Haile Struggles But Wins BUPA Manchester 10k Haile's previous bests at Manchester were 27:25 (2005) and 27:39 (2009). 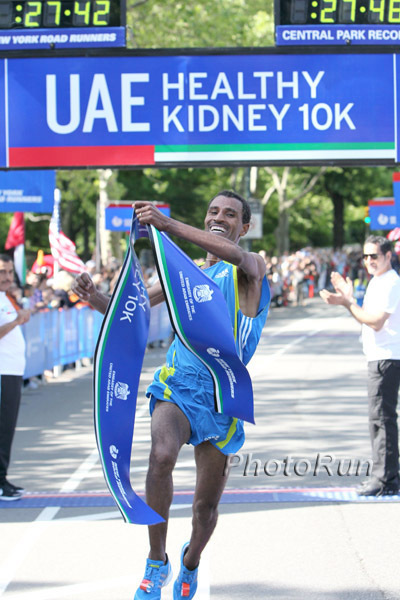 Worknesh Kidane (2003 world XC champ) won the women's race and is the wife of Healthy Kidney and Central Park record-setter (and xc world champ) Gebre Gebremariam. *Boards: Haile runs 28:02 - does this mean he'll run Chicago? 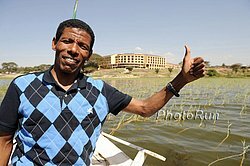 Gebre Gebremariam was last year's World Cross champ, so the tough NYC course was no problem for him. Khalid Khannouchi ran 30:31 and was one spot ahead of former NCAA champ Bobby Curtis, who ran 27:33 2 weeks ago and perhaps was just doing this as a tempo run. Bolt Expects Very Fast Time Wednesday In South Korea Asafa Powell opens with 9.75, Tyson Gay runs 200m straight today in GBR after early-season 400 success, Usain Bolt has already run 19.56 (and 8.79 unofficial relay split at Penn) ... are we going to see the most unbelievable year for sprinting in the history of the sport? High School Freshman In Korea Runs 15:38 5,000m A national record as well. Pretty damn impressive. Recommended Read #1: Mike Hurst - A Personal Perspective On Coach Charlie Francis A great read from a friend of Francis titled "End of good run for flawed coach." Recommended Read #2: Former Ivy 800m Runner Writes Great Piece On Genetics And Speed For SI.com Nature or nurture? Genetics or environment? What are the genticists finding out about specific genes and how they relate to sprinting? LetsRun.com's The Week That Was In Running This week we put an end to the Rupp-Solinsky controversy, analyze the continual decline of Jeremy Wariner, announce the return of Walter Dix, tell you why Usain Bolt is clean, fall in love with the 25 kilometer distance, and amazingly discover that hGH actually helps performance. All that plus Haile Gebrselassie puts an end to the barefoot running craze and a great race video from Australia. Chris Solinksy's Run (And LetsRun.com) Gets A 3 Line Mention In A Mainstream Sports Blog Look out, NFL. Proof of the soaring popularity of track and field (see Washington Post article below). The story on a high school track team losing it's league championship because of a pole vaulter wearing a friendship bracelet got a full story. Seriously, we want to give a shout out to the LetsRun.com fan who fought hard to get Solinsky a little press. Washington Post: "Track's Popularity Soars Despite Lack Of US Star Power" LetsRun's co-founder Wejo is quoted and Rojo is mentioned as Amy Shipley of the Washington Post examines the positive state of track in America. We like the article but (despite our rapidly rising numbers) aren't sure the sport is soaring in popularity, considering the average person on the street couldn't name a single US track star. We're glad however to see the sport in a positive light (but never thought the sport was down in the dumps) and think the article is proof the sport's execs need to get the sport on network television or ESPN more often. Merlene Ottey - Now 50 - Plans To Compete For Slovenia At Euros California-based former world-leading sprinter (with a checkered drug history) will compete into her 6th decade of existence in Barcelona this summer. Video: James Mbugua Wins Mombasa Marathon In 2:08, Lowers Record By 6 Minutes 2:08 in Mombasa sounds amazing to us. Jeremy Wariner - The Star Who Got Hosed? Neville Breaks Wariner's 5-Year 400m Win Streak! Well, not technically, but look at these stats: Before Olympic bronze medalist David Neville beat him in Puerto Rico this weekend, and taking out confirmed drug cheat LaShawn Merritt, who beat him 6 times, Jeremy Wariner had not lost a 400m since September of 2005 (he did DNF twice, but other than that, 51 consecutive wins). We give a shout out to Wariner, who - since his senior year at Baylor in 2004 - raced the 400m 91 times and, ignoring Merritt, won 82 times, including 2 Olympics and 3 World Championships (plus 5 relay golds). *Decathlon champ Ashton Eaton Wins LJ On Last Attempt, Runs 10.19w, Leads 4x1 Team, Makes hiHurdle Final Oregon men have a big team lead, but Chris Derrick and Stanford went 1-3 in the men's 10,000 and outscored AJ Nation and UO in the steeple. The Lady Ducks trail 'Zona. All the big name Ducks made the finals, including 4 in the men's 1,500. Lightning Stops SEC *Razorback Alain Bailey Leaps 27'5" To Win Epic LJ *Live Results Technically Jamaica's Bailey set a WL but Aussie Fabrice Lapierre has jumped way farther wind-aided. Auburn leads Georgia w/ most finals still to come. Men's 10,000: Solomon Haile 4th, 12 finishers and 11 DNFs. Women's 200: 23.70 doesn't make the final! Big 10 *Big Ten Live Results Minnesota men have huge lead going into final day as Indiana goes 1-2 in really fast steeple (8:43). Wisco freshman Canadian Mo Ahmed wins 10k in 29:03. Boards: Big 10 Minnesota W10k: Minnesota, Megan Duwell go 1, 2, 4 and lead after Saturday. Bridget Franek smashes Anna Willard's steeple meet record by almost 10 seconds. IC4A *Live Video A first: GMU frosh Chris Carrington runs 1:48.96 and misses the final thanks to strong 800 prelims. Big 12 *Schedule *LIVE Results *LIVE Blog Iowa St. and Lisa Koll dominate women's 10k, Colorado men's 10k. Blazing Times In Doha From 100m To 5,000 Asafa Powell impressed the crowd with a 9.75w in the first round. Distance times were fast as well - 12:51s for Eliud Kipchoge and Vincent Chepkok while David Rudisha and Asbel Kiprop ran 1:43s in the 800. Olympic champion Nancy Langat won the women's 1,500 in 4:01 to announce her return to the top. World champion Joseph Ebuya struggled home in 13:33 9th in the 5,000. Asafa Powell Impresses, Allyson Felix Cruises In Opening Diamond League Meet Asafa Powell ran 9.81 in the 2nd round despite a terrible start. Two 12:51's in Doha! Think there might be a new PED out there? At least someone noticed the 12:51. If an American ran this time, it's all anyone would talk about for a month. Instead, Kipchoge did it in 88-degree heat. *Is this the year that Kipchoge cracks 1240..or at least sets a PR??? *Joseph Ebuya is not very good We don't care what he ran in Doha. He's the World XC champ. We're surrprised he ran the race, but wish Universal Sports had even acknowledged him being on the starting line. Anna Pierce And David Torrence Win US 1 Mile Road Champs Torrence ran around the streets with an American flag and black socks after he took it to the field in the last 200m as Lopez Lomong was left in 6th. Sarah Bowman came up to pass race leader Christin Wurth-Thomas for 2nd, but nobody could match Pierce. HBOs Real Sports Examines Barefoot Running In Next Episode Bryant Gumbel's show airs on Tuesday and will include an interview with Born to Run author Christopher McDougall. 21-Year-Old Jamaican Quarter Miler Female Tested Positive At World Indoors Jamaican athletics leaders are playing dumb as "promising" young sprinter Bobby-Gaye Wilkins returns A and B positives for unknown substance. Alan Webb Marrying Julia Rudd October 15 Congrats to Alan and Julia. Of course you can discuss what this means for his running career here. Or maybe you already knew about the nuptials because there was a thread on our message boards in September saying the same thing. Justin Gatlin Ready To Return To Competition And USADA Head Says He Should Be Accepted Into Meets "If you want lifetime bans after the first offense, then you should be screaming and yelling about that, not disregarding a rule that is in place that allows someone to compete. That's unfair." - Travis Tygart in the Washington Post. 13 Years Later, British 4 x 400 Team Gets Gold Medals From 1997 Worlds After US DQ Antonio Pettigrew admitted to being a cheat. IOC Retroactively Testing 2006 Olympic Blood Samples For CERA CERA is the drug athletes thought was undetectable, so expect a few positives. Good Read: Brief Chat With Paula Radcliffe's New BFF Kara Goucher Kara talks about training with her new mentor Paula, using the Alter G to train with a growing baby, Alberto's searching for expert advice on health effects of training while pregnant, and her plans next year that include the Boston Marathon and Oly Trials. Pregnant Paula And Kara To Run NYC Mini Together The high-profile duo are working with Mary Wittenberg to make an appearance at the Mini 10k as runners (i.e., not racers). Not A Joke Headline: "Goucher and Radcliffe to give birth on the same day." For Better Or Worse, Lamine Diack Elects To Run Again Joe Battaglia says that new blood in the form of IAAF VP's Sergey Bubka or Lord Seb Coe might be better for cash-strapped IAAF rather than 78-year-old Senegalese Diack, who struggles to speak the English language. *USADA Loses Case, Depressed American Hammer Thrower Gets Drug Ban Reduced Judge decides illegal substances taken while very depressed are pardonable. *Embattled ASA Getting Back On Its Feet Athletics South Africa's stock is rising with some new corporate investments after a disastrous '09. Zürich Weltklasse Begins Announcing Big Name Star Entrants Translated: "Bolt (200m) and some other people will run Zürich." Recommended Read: The Story Of New Teenage Marathoning Star Eliud Kiptanui Documents say he's not even 20 years old. He was supposed to run his marathon 3 weeks ago. Prague's marathon course is tough and parts of it go over cobblestones. His family is so poor he had to drop out of school ... but he just won 75,000 Euros, ran 2:05 and crushed the WC 4th-placer and now hopes to fund his siblings' schooling after just his 2nd marathon. 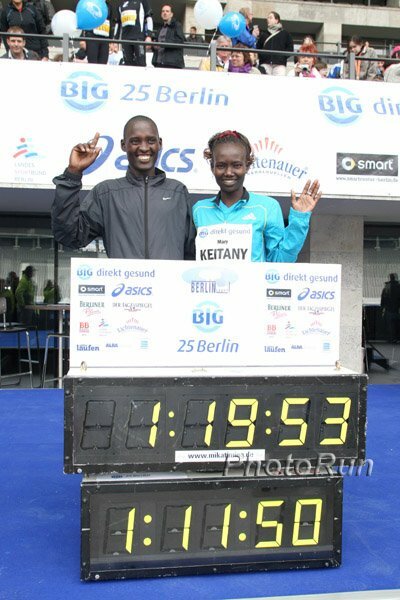 Keitany And Coach Talk About Finally Running The Marathon Near the WR at the half marathon and now the 25k WR holder, Mary Keitany is the only woman road racer out there who seems to be within light years of Paula Radcliffe in her prime.